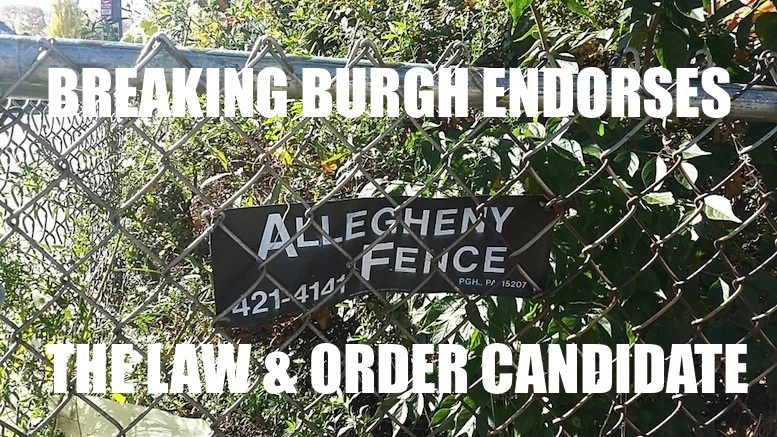 Breaking Burgh endorses Allegheny Fence - the Law & Order candidate. It’s time to vote again in Pittsburgh and there’s no icestorms or microbursts so there’s no excuse not to get out there and do your civic duty. If there’s a referendum on anything, we recommend ‘Yes’, but then we always vote yes whatever the question is, because we like to be positive. If you haven’t voted yet, please read this voter guide in its entirety and share it freely. If you have voted already, read it anyway. If it makes you change your mind, you can always go back to the polling station and alter your vote – just tell them we said it’s okay. Obviously you should vote because it’s the responsibility of all citizens who enjoy the freedom of living in a democratic republic. But if that doesn’t do it for you, here are some other reasons you should get out there and punch that ballot or touch-sensitive voting machine. 1. You might be able to get out of work early. You might think you can use this excuse to get out of work early and still not vote, but a savvy employer may ask to see your voting slip the next morning. 2. You get to influence who is a Judge or who passes laws. If you plan to do some things in the future that are not strictly legitimate, voting day is a chance to influence who will sit in judgment of you if you’re caught, or even who gets to make the law in the first place. So get to the polling booth and vote for the most inappropriate candidate, preferably one you know is a friend of Mary Jane. 3. You get to sneer at nonvoters. If there’s a low turnout and the result is unpopular, you can act superior and say ‘well at least I tried to change things’. 4. You get to meet new people. If you’re a creeper, people who wouldn’t normally give you the time of day might engage with you because your vote counts as much as everyone else. This is a great opportunity to try to find out where they live and become even more creepy. Even if you know absolutely nothing about the candidates or the offices they aspire to, it’s still vitally important that you vote, so that your whimsical uninformed choices can influence the outcome. If you can’t decide, an easy trick is to vote for the person who has the most signs. As is the case every year, we are particularly impressed with the vociferous campaign run by longtime Superior Court incumbent Judge Stop. His bold minimalist red campaign signs literally saturate the city, and we wholeheartedly endorse him yet again. Another good reason for voting for the candidate who can afford the most signs is that they probably have the most money and money wins election. Who doesn’t want to back a winner? Be the first to comment on "Breaking Burgh’s Awesome Voter Guide"